MILTON, DE – Dogfish Head has bottled the the first batch of the high-strength 120-Minute IPA for the first time in 20 months. Today, they blogged about the bottling process of making the beer and which markets will be receiving the initial batch. This morning we started up the bottling line for the first batch of 120 Minute IPA in 20 months. As many of you saw on ‘Brewmasters’ last year, we determined that our last batch of 120 Minute didn’t meet our Quality specs and we dumped the beer. It was a hard beer to lose – both because of the enormous cost of the ingredients in that one and the fact that it is an Occasional Release for us and lots of you were anticipating it. We have been working hard on it. Pretty much every team in the brewery is excited to have the beer coming off the line today. There was a collective sigh of relief and a lot of excitement as Chad handed off the first bottle to come though the line. Thanks to all my co-workers at Dogfish Head who played their part in this re-release – you all rock! Instead of the three 400bl releases for 120 Minute we’d planned for in 2011, we opted to work on smaller volume batches. Today, the first 100bbl batch made it to the bottling line. Sorry for not keeping you more in the loop, but we didn’t want to jinx things (that said, there are more than a few of us who are convinced that every truck delivering this batch to our wholesale partners will disappear into thin air before making it to the warehouses safely – our fingers are crossed). So, here is the plan for this first batch. Our motto is ‘share and share alike’ on this one. Like I said, it is a single small batch (but we’re hoping to keep em coming). We are divvying this batch up amongst our wholesalers who are legally permitted to sell it. There are still plenty of markets where 120 Minute IPA is not legal or approved for sale. 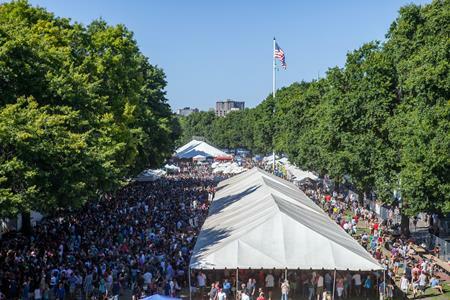 Delaware, Massachusetts, Maine, Connecticut, New York, Washington (state), Oregon, Arizona, Nevada, Florida, New Jersey, Virginia, Maryland, Kentucky, Michigan, Illinois, Pennsylvania, Colorado, and Washington DC. We did keep some cases for sale from our Brewery and Brewpub. 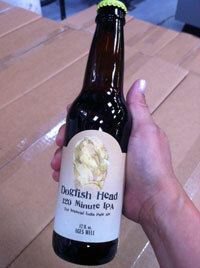 Our 120 Minute IPA bottles will go on sale on Friday, June 24 2011. Due to the limited availability and our ‘share and share alike’ view on this beer – we are limiting sales to one 4-pack per person. We will sell them for $30 per 4-pack. We will have them as long as they last. In terms of distribution, we do not know which retailers will get these cases. We have no control over how our wholesalers share their allotments or how retailers price this beer. We hope they are fair and we hope that there isn’t crazy price gouging. We do assume that as the beer heads to retail, it will begin appearing in our Fish Finder (this database is fed from information provided by our wholesalers). We will begin shipping the 120 Minute IPA to our wholesalers in the coming days, but some markets may not have an order shipping for a few weeks. This means it will begin appearing on retail shelves sometime in the next few days to the next few weeks. Thanks so much for your patience. Hope you enjoy the beer. We hope to have even more on the way soon.